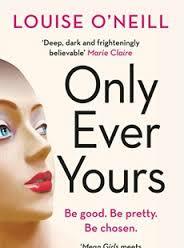 I am extremely grateful to Hannah Robinson at Quercus books for a review copy of Louise O’Neill’s ‘Only Ever Yours’. An updated adult version of this young adult text is published on July 2nd 2015.
frieda is an eve, a created female whose role in life is to be good, be pretty and do as she is told. As she approaches the Ceremony when her future life will be allocated, as a companion, a concubine or a chastity, the constant need to be perfect takes its toll and her life begins to unravel as she tries to conform. I cannot say that I enjoyed ‘Only Ever Yours’ as that would be an incorrect verb to apply. Its dystopian content is stark and bleak, being unnervingly, chillingly, possible. Reading it put me in mind of Attwood’s ‘The Handmaid’s Tale’ or Forster’s ‘The Machine Stops’. I found the constant competition between the girls as wearing as did frieda and it took me a while to empathise with any of the characters. I think this is part of the skill of the writing. O’Neill makes them generic and only physically distinguishable to start with because that’s how they have been created. The mysterious isabel is thoroughly spurned by society and the gradual unfolding of her story adds another layer to the text. By the conclusion my heart went out to isabel and freida in particular. The writing is highly skilful. None of the girls is given a capitalised name to reinforce their inferiority to males and to the Father in particular. Frequently referred to by number, they are not allowed an identity of their own unless it is based on physical image and cruel comparison. The sadness is that this is how many girls and women feel today. Although men control women, the story isn’t totally misandrist. The aptly named Darwin’s frequent injuries illustrate that men can, and do, suffer too. There are challenging themes in ‘Only Ever Yours’ and the book can be read on many levels. Bullying, the sense of being an outsider, physical perfection, the use and abuse of drugs, genetic engineering, homosexuality and identity are laid bare and underpinned by clever references such as Rainbow 24 as an homosexual gene or the capitalisation of pronouns to describe the Father. I’m not sure how many reading ‘Only Ever Yours’ will be able to say they enjoyed it, but I’d challenge any reader not to be horrified and, ultimately, moved by a society that may not be too far removed from our own. The messages in ‘Only Ever Yours’ will reverberate in my mind for some time. I thought it was fantastic – a brilliantly realised dystopia. Definitely not just for YA readers. I’m looking forward to Louise O’Neill’s next one which sounds just as hard-hitting. It’s quite a disturbing read isn’t it? Thanks for dropping by the blog.